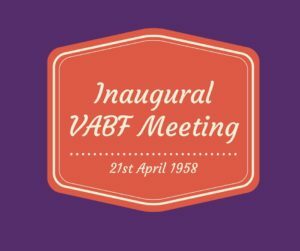 “At 6pm on 21st April 1958 a meeting of interested people was convened by Mrs L. Russell – Secretary of Actors’ Equity (Victorian Division) – for the purpose of forming a committee to launch the Victorian Actors’ Benevolent Fund. Moira Carleton, Bettine Kauffman, June Lansell, June Clyne, Sheila Florance and Kenrick Hudson. 59 years later and the now-named Victorian Actors’ Benevolent Trust (VABT) continues to provide emergency financial assistance to those in the entertainment industry who, through poor health or ill fortune, find themselves with nowhere else to turn. We take our hats off to those incredible pioneers who forged the way all those years ago and to the hundreds of committee members who have worked tirelessly to ensure the work of this inaugural committee lives on. Chris Connelly, Julie Forsyth, Dina Mann, Robyn Arthur, Matthew Emond, Clare Pickering, Mark Williams, Michael J Wilkie and Jana Wilkes.